27 years, 10 months, 5 days old age. Sam Billings will turn 28 on 15 June, 2019. Only 1 months, 25 days, 21 hours, 11 minutes has left for his next birthday. Sam Billings has celebrated the total number of 27 birthdays till date. See the analysis by days count and bar graph. 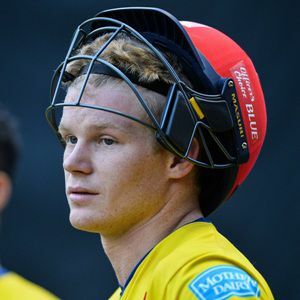 Sam Billings was born on 15-06-1991 in Pembury, Kent, South East England, United Kingdom. He is an English Cricket Player. Sam Billings, an inventive cricketer, and fiercely-competitive all-round sportsman made his England debut against New Zealand at Edgbaston in 2015. He played five ODIs and two T20s without making fifty but he fitted the design of a more high-energy England side. An IPL gig followed with Delhi Daredevils where in brief flashes he proved himself one of England's finest players of spin and an electrifying fielder. His passion for cricket has communicated itself to the Kent crowd in a manner that suggests he might one day stand confidently alongside such exalted company. Billings had become a player to be reckoned with was apparent from the moment he blitzed an unbeaten 135 from 58 balls against Somerset in a 50-over tie at Canterbury. Marcus Trescothick, Somerset's former England captain, identified Billings as a potential rival for Jos Buttler, quite an accolade considering Buttler's Somerset roots, and said "Billings absolutely annihilated us." A prolific run-maker at the domestic level and at the various t-20 leagues around the world though hasn’t made it big in the little opportunities that he has been given at the International level. He averages a mere 17 in the 21T20Is that he has played thus far but with the talent that he possesses, he will surely transform his domestic level heroics at the international level too. He was born to William Billings. He is the grandson of former Racquets player Ron Billings. He is married to his longtime girlfriend Sarah Cantlay. He has praised Rahul Dravid for improving his batting against spin. He has played tennis, football, and racquets at the junior level. He has featured in popular T20 leagues like the IPL, BBL, BPL, and PSL.